Paso Robles 2005 is already in the works. Our 2005 CD is Dave Watson. We request that you take a moment and pre-register for the contest - it will make our lives easier and make your tech go quicker! Our objective for pre-registered contestants is you show up, sign your form, and practice. 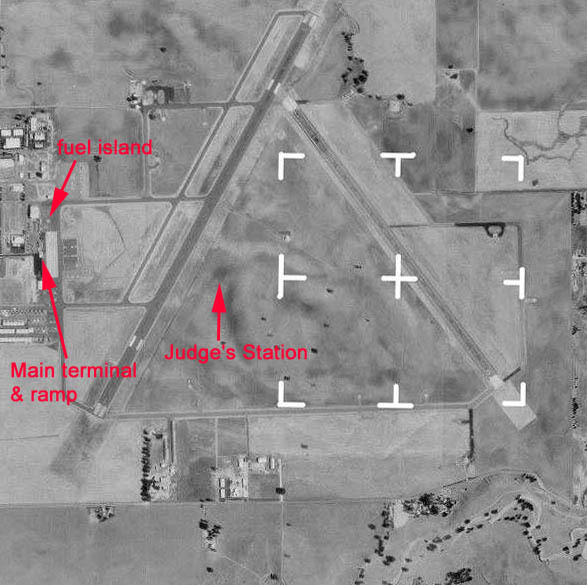 Paso Robles Airport, California (AirNav info or AeroPlanner info). N35 40.4 W120 37.6. CTAF 123.0. Airport office (805)-237-3877. Check NOTAMS before departure. Check out an aerial photo of the Paso box. Make your reservations NOW! Please see the hotels page for block rates. We highly recommend reserving your room as soon as possible. Due to other events going on this same weekend accomodations are filling up fast. San Luis Obispo or Atascadero are excellent alternatives for hotel rooms. Camping and RVs are welcome at the airport. Food available on the airport Thursday, Friday, Saturday. Friday evening pizza party. Saturday evening banquet. The banquet location will tentatively be held at the Estrella Warbird Museum. It will be good! Fill out the Paso Robles Contest Pre-Registration Form. Or, if you prefer, you can download a blank contest registration form (Adobe Acrobat reader required). Pilot certificate and proof of BFR, Medical certificate, Proof of insurance, IAC membership and FAI license (Unlimited only). * Hangar space will be allocated on a first come, first served basis. Contest Director: Dave Watson, 408-445-1289. Please take a moment and pre-register for the contest.